This is our last block for this quilt. How have you been doing? We'd really like to hear your comments. This week's block is Double Monkey Wrench. It is made up of several units we have used before. Half square triangles and strip blocks. This week is we are taking a look at the flying geese block. This is another block that can be made a number of ways. You can use the half square triangle method used for our Friendship Star block (by making two squares and joining them together) or you can use the Flip Corner method or you can use foundation piecing method. Since we have already learned the first two methods, let's take a look at foundation piecing. You can use either of the other methods if you choose or try this instead. Today, being a weekend, is a definite reason to write something a little more personal. For those of you who know me a little, you'll know that I have an autistic son. My youngest, Hamish who is now 21. Yes the years just fly by. Well today, being a nice bright sunny day, I was hanging the laundry outside on the line when I heard my son-in-law, Warwick talking to my son. I knew they were out working on something but wasn't quite sure what. I did hear the tractor running too. Written Inspiration is our next part in finding inspiration for quilt making. Be sure to read part one: Visual Inspiration. Each quilt tells its own story and is unique with its own characteristics, but where does the inspiration come from to make a quilt? Over the next 4 blog post I'm going to give you 13 ways to find inspiration for quilting. Each post will be divided into a category group. In most points, I will include my own personal examples to give you further understanding for each. Our first category is visual inspiration. 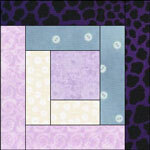 This week's block is the very popular log cabin block. This is often the first block new quilters make. Log cabin can be made in several ways. I'm going to show you strip piecing for this block. Others may prefer foundation piecing. We have a free pattern for all our newsletter subscribers. I bet you can subscribe faster than you can do this jigsaw! Today I had to share a quilt from one of my students. Currently I have running my Bargello Seasons online class at Quilt University - this is always a popular class and it shows by the work that is created in it. Jo Dickson is just one student in my class this semister and is delighted to share her work with us all. Her Bargello in Spring (the first bargello of the series) is all complete and slightly different to the usual Spring Bargellos.